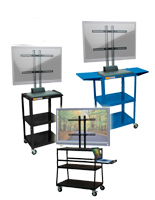 Looking for a mobile flat panel television stand for an office, school or other professional environment? 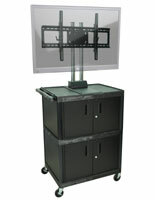 This AV cart with TV mount has a built in bracket for a plasma screen or monitor and is ideal for viewing purposes. 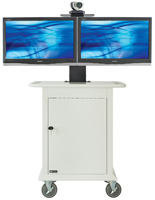 Each of these stands also features a secure locking cabinet for storage of needed AV devices. 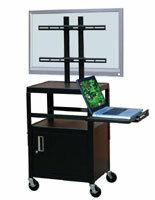 This mobile furniture, a durable AV cart on wheels is constructed of sturdy materials for long lasting use. Fabrication materials include steel, plastic, wood, MDF, and other strong materials that ensure a long lasting fixture. Each trolley provides a great solution for professional settings to transport multimedia and AV devices in a safe and efficient way. 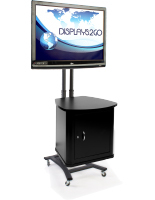 Displays2go has an impressive selection of media and projector stands in the online catalog! 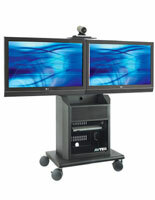 Educational facilities and business offices are sure to find an AV cart to meet any need! These stands range from basic models with just a security cabinet to furniture pieces with pull out and drop leaf shelves, built in power strips, adjustable height frames, and other unique features! 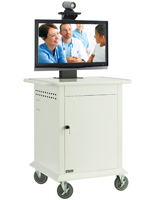 This AV cart with cabinet includes a screen mount that is designed to meet VESA standards. A VESA measurement is a set of standards for the production of flat panel televisions and PC monitors. 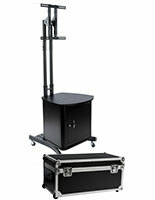 Each media cart with wheels has a specific range of VESA measurements that can be accommodated. A complete list of VESA compatible measurements can be found under the SPECIFICATIONS tab on the individual product pages. Customers should confirm the VESA measurements of the flat panel television and compare that to the VESA threshold of the chosen media cart before making a final selection from the Displays2Go online catalog. While it is common practice for most manufacturers of LCD televisions to comply with this VESA standard and publish the measurement at the time of purchase of a television or monitor, customers can determine the VESA measurement by measuring the hole pattern on the back of the plasma screen. 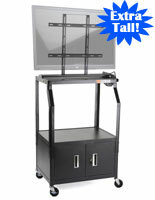 Each TV cart with wheels sold in the online catalog is compatible with a wide range of VESA measurements. How can customers check the VESA measurements of a flat panel screen and compare the compatibility of the measurements with the television mounts? There are 4 mounting holes on the back of each LCD television or monitor. The distance between these holes, in millimeters, determines the VESA measurement compatibility. Once this measurement is established, customers can use it to find an AV cart with a mount that will support it. Almost all manufacturers adhere to this standard and the specific measurement can often times be found on the television or monitor packaging. VESA size can also be found in the guidebook that is included with each flat panel screen purchase. If the VESA measurements are not listed in the guidebook that comes with a television purchase, it can be determined by taking physical measurements of the hole pattern. Both horizontal and vertical measurements should be taken to determine VESA compatibility. To take these measurements simply measure the distance between mounting holes, both vertically and horizontally. 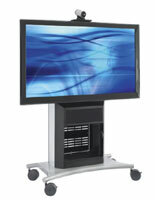 Each AV cart is compatible with many standard VESA sizes. After determining the VESA measurement of the television or monitor, compare that measurement to the list of compatible measurements on each product page. 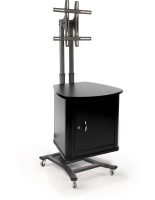 These stands with flat panel television mounts are ideal for all professional locations. 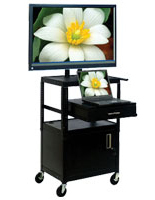 Each mobile cart with cabinet is great for use in a school or office that needs to transport multimedia devices on a regular basis. Each mobile media furniture unit is highly portable and features (4) rolling casters that glide easily over most floor surfaces. These stands can also feature two wheels that lock and/or break for added stability when in the stationary position. 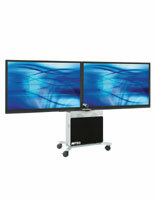 Most flat panel mounts that are constructed from durable materials for long lasting use also have other useful features that make these units popular for busy professional settings. 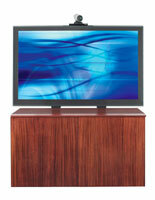 Each multimedia fixture features a locking cabinet that securely stores all necessary AV devices when not in use. Most models have a cable management hole in the back of the cabinet to keep wires neat and tidy at all times. Many stands also have a built in power strip with cord and multiple outlets to provide users with one convenient power source for multiple pieces of equipment. Each of these flat panel trollies may also feature side shelves that can be pulled out from the front or sides of the fixture as well as drop leaf sides for added presentation space. 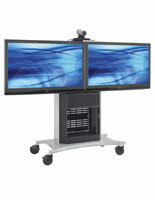 These stands with television mounts make presentations easy! 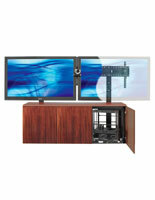 Why should customers choose a mobile media fixture with a television mount? Unlike traditional pieces of office furniture, this trolley is highly portable. 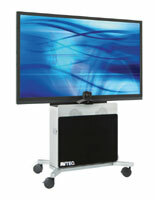 These stands have rolling wheels and makes transporting audio visual devices easy and efficient! Customers are able to transport multiple pieces of equipment at once minimizing the chance of damage to devices, and lowering the risk of injury from carrying heavy equipment! 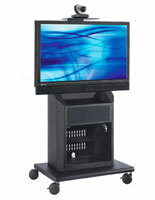 Purchasing a media cart can help budget conscious professional offices and schools obtain the tools they need but at a lower cost! 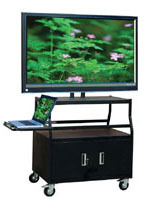 By using a multimedia trolley with rolling casters to transport equipment, a school or office no longer needs to supply each classroom or meeting space with its own devices. 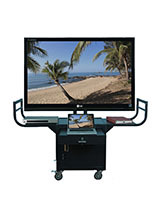 Each television cart can be shared among multiple classrooms and offices, thus alleviating the often costly burden of purchasing AV devices for each space. 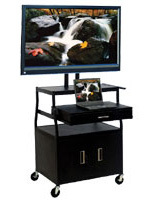 Each of these portable flat panel stands makes presentations and conferences easy, as all needed audio visual devices can be stored on one single trolley. Featuring unique additions such as side shelves, power strips, surge protectors and pull out trays, there will certainly be a solution to fit every need! 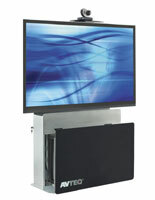 Displays2go has one of the largest selections of flat panel stands of any online retailer! Each multimedia furniture unit is VESA compatible allowing customers to find a cost effective portable trolley that meets any need! This unit is constructed of durable materials such as steel, wood and plastic for long lasting use and includes many functional features that enhance the usability of each trolley! Please note: It is important for customers to view product pages in full for a list of product specific features to select the flat panel stand to fit the specific need! 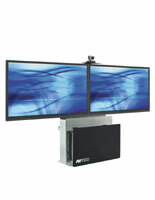 Displays2go has a large array of VESA compatible television mounts and rolling stands! 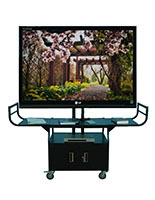 The online catalog features many VESA compatible mobile media units as well as other trollies without television brackets and POP displays. Customers can place an order by using the secure online ordering system, which can be visited 24 hours a day. We also accept orders via telephone by calling 1-800-572-2194.